PORT MORESBY: Kikori MP Mark Maipakai has described the Opposition Leader Don Pomb Polye as ‘a disciplined, wise and brilliant leader,’ who has the potential to become the next Prime Minister. 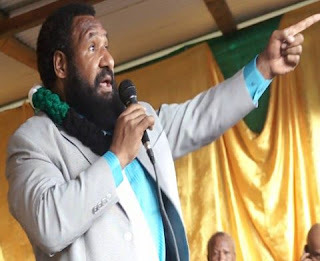 Mr Maipakai, who is the Opposition’s shadow Minister for Finance and Planning, said Polye was matured, affluent in economic management and had earned the trust and confidence of the donors and international community. He added that despite their age differences, he had decided to follow him when he was sacked as the Labour minister. “Because I admire this young leader, I have decided to follow him. I believe that he will become the Prime Minister soon. “Don is a highlander but is a true Papua New Guinean. He is honest and service-oriented so this is why I am loyal to him for a long period,” he said on Wednesday (June 22) when speaking to students, parents and community leaders at a ground breaking ceremony of Seventh-Day Adventist church headquarter in Mendi, Southern Highlands. “We have nothing personal with the Prime Minister and those in government. We only have had differing views on how to provide governance in the country,” he said. The Kikori MP said this was another reason why they were sacked from the government. He added that they stood on principles of rule of law, good governance, systems of governance and democracy. He further said he was with Polye because of his advocacy in fighting corruption and governance issue. “The adverse implications, which we have projected as a result of the bad decisions, have taken toll. “Our people have felt their pinch,” he said. Meanwhile, he only made a financial commitment towards the building of the church complex but he did not disclose its figure.